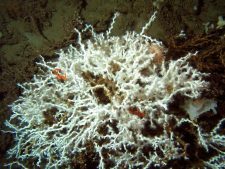 Synopsis : The full title for this study is EXPLORATION AND RESEARCH OF MID-ATLANTIC DEEPWATER HARD BOTTOM HABITATS AND SHIPWRECKS WITH EMPHASIS ON CANYONS AND CORAL COMMUNITIES. See the link to FedBizOpps below for the complete notice. Organizations interested in participating must register interest in the opportunity. Copies of the complete solicitation will be provided to registered vendors after the April 30 deadline for pre-proposal registration.